Gloom thy waters with their shade. "Pavilions, grand dinners with music, 'Yankee Doodle' constantly, and cards. and billiards," Henry Bedinger wrote to his wife from Copenhagen on June 23, 1858. "Of the latter I had a special match: His Majesty and myself against the French and Swedish Minister. ... Think of Henry Bedinger playing billiards with a King!" In retiring from the House of Representatives to private practice, Henry Bedinger was not forgotten by the Democratic Party, which he had loyally supported, and in May 1853 President Franklin Pierce appointed him to replace Miller Grieve as charge d'affaires to Denmark. He quickly accepted the appointment, hoping to improve his financial situation. His annual income from law was a paltry $100. Explaining her husband's frustration to her sister, Mrs. Bedinger wrote, "There is no lawyer in the country who is supported by his practice alone; even the oldest and best established can scarcely earn subsistence at the bar." Bedinger accepted the appointment in June and a month later sailed for Denmark. His wife, who was expecting their second child later in July, remained behind, planning to join him in the fall. Bedinger presented his credentials upon arrival to Christian A. Bluhme, the Danish minister of foreign affairs, and then began to carry out the instructions given him by Secretary of State William Marcy. He had been charged with a delicate mission - to work for the abolition of the Danish Sound dues. Since the fifteenth century, Denmark had exacted duties from all ships that passed through the Danish Sound, which connected the Kattegat and the Baltic Sea. Sailing through the Sound under the threatening guns of Kronborg Castle, few nations dared refuse the levies, although most regarded them as little short of outright piracy. During the first quarter of the nineteenth century Denmark had attempted to assuage some of these hard feelings by signing treaties with various "favored" nations, On April 26, 1826, the United States had signed an accord with Denmark, which provided that "neither the ships of the United States nor their cargoes shall in passing the Sound or the Belts, be liable to higher or other duties than those which are or shall be paid by the most favored nations." Even with these concessions, the United States believed that the Sound dues were a form of refined blackmail levied against its shipping and continued to work for their abolition. When Charge Bedinger broached the subject of the Sound dues with Bluhme, the foreign minister emphatically replied that Denmark had exercised the right to levy the duties since "time immemorial," and that all other nations had tacitly assented to this right. The Danish government did study the problem, however, and a few months later Bluhme suggested that his government might be willing to give up the duties in exchange for monetary compensation. In July 1854, Bedinger's rank was raised from charge to minister plenipotentiary, the highest position in the American diplomatic corps at that time. He thus became the first accredited United States minister to the Danish court. With this new prestige, he continued to push for the termination of the Sound dues. Internal political troubles and the resignation of the Danish ministry caused delays, and it was several months before Bedinger had an opportunity to present his case to the new minister of foreign affairs. In the meantime, the United States government decided to force the issue by terminating its 1826 treaty with Denmark. When, during an interview with Bedinger on April 12, 1855, Foreign Minister M. J. Scheel asked whether the United States was willing to pay compensation in lieu of the tolls, Bedinger replied that his instructions forbade him to offer a bribe for that which was clearly America's right-freedom on the high seas. He then gave the Danish government the required one year's notice that his country intended to discontinue the treaty. 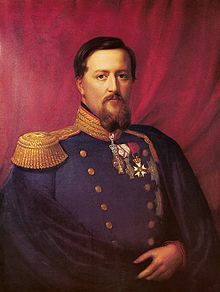 King Frederick VII and his government were unwilling to yield to the United States, but Bedinger continued to hope that a satisfactory conclusion to the diplomatic tangle could be reached. He was particularly encouraged by several articles that appeared in the Danish press suggesting that the entire question of the Sound dues be submitted to a thorough investigation in an attempt to resolve it in a manner satisfactory to both Denmark and all other foreign nations. The Danish government moved slowly, however, and in September 1855, Bedinger wrote his brother-in-law Edmund Jennings Lee that: At the King's dinner the other day, His Majesty came up to me, and after a few words said, "So you are going to make war upon my Kingdom, are you?” I said, "I hope not, Sire, I hope Your Majesty will not permit us to do that.” He said, "Mon Dieu, how can I prevent it? You are going to war about the Sound dues.” I replied, "I cannot think so, for I am sure Your Majesty will grant us the simple right which we demand, rather than drive to arms a people who have been so long honored with your friendship.” He said, "Humph”, and walked away. King Frederick, "So you are going to make war on my Kingdom." Bedinger, "Sire, I hope your majesty will not permit us to do that." King Fredercik,"Mon Dieu, how can I prevent it?" Bedinger, "...I am sure Your Majesty will grant us the simple right which we demand." King Frederick, "Humpf", and walked away. A number of months later, delegates from various European nations met in Copenhagen for a conference on the Sound dues question. The United States chose not to participate in the conference, but Bedinger did let the Danish government know that in return for Danish recognition of America's right to pass through the Sound, the United States was willing to compensate Denmark for the cost of maintaining lighthouses, buoys, and other navigational aids. By January 1857, Minister Bedinger had drawn up the first draft of a proposed convention, which he submitted to the Danish foreign office. After a few months further delay, a settlement was reached. The United States paid Denmark $393,011; in turn, Denmark agreed to end the collection of dues from American commercial vessels and pledged to keep the Sound properly marked. Similar agreements were reached between Denmark and other concerned European nations. ​Bedinger received a congratulatory note from Ove Wilhelm Michelsen, the new Danish foreign minister. "You have displayed so much interest in adjusting this delicate question in a manner equally satisfactory to both parties," Michelsen wrote, "and you have shown so much zeal in the accomplishment of this object that I feel confident that you will hear with satisfaction that the king, my august sovereign, upon approving of all the provisions contained in the above convention, has instructed me to prepare the act of ratification.” He added that his government appreciated the "distinguished manner" in which Mr. Bedinger had "seconded the efforts" made to bring the negotiation to a favorable termination. The American minister also received a flattering letter from the Danish king. 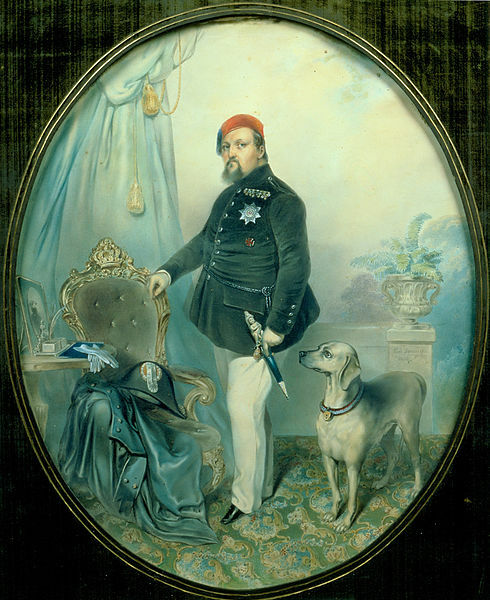 "My Secretary of State for Foreign Affairs has felt it his duty to direct my attention to the laudable course pursued by you in the course of the negotiations," Frederick VII wrote, "and with the view of bestowing upon you a testimony of the feelings I entertain for you on that account, I address to you the present letter, hoping that it will remain a grateful remembrance of the manner in which you have discharged your duties towards your own country whilst at the same time consulting the interests of my crown.” The king also presented Bedinger with a handsome silver tankard, which the American minister, as a public servant, was not able to keep. Though Bedinger's quest for relief from sound dues had provoked the King, an agreeable settlement was reached. The King wrote to Bedinger, "...the laudable course pursued by you in the course of the negotiations will remain a grateful remembrance of the manner in which you have discharged your duties towards your on country whilst at the same time consulting the interests of my crown." Caroline Bowne Lawrence, wife of Henry Bedinger, with children Mary, standing, and Henry, in Copenhagen. Life was not all work for the American minister in Copenhagen. Carrie Bedinger followed her husband to Denmark in 1853 with three-year-old Mary and infant Harry, and the Bedingers settled in an apartment near Saint Anna's Platz. Not far from their apartment, at the Yellow Palace in the Amaliengarde, lived Prince Christian of Glücksborg, who later became King Christian IX of Denmark, and his wife, Princess Louise of Hesse. The couple's young daughters, Alexandra and Dagmar, passed the Bedingers' door on daily walks and Mary Bedinger was envious of the handsome ostrich plumes in the princesses' hats. Little did she imagine that Princess Alix would one day become queen of England, and Princess Dagmar, empress of Russia. A visitor always welcomed to the Bedingers' apartment was the tall, lanky poet and novelist Hans Christian Andersen, who was celebrated throughout Europe and America for his enchanting fairy tales. Andersen and Bedinger were both fond of chess and matched their wits playing the game. Social life in the court of King Frederick VII was much more subdued than was customary in European capitals. The Danish nobility snubbed Frederick's third wife, a commoner who had once been a ballerina and the king's mistress. 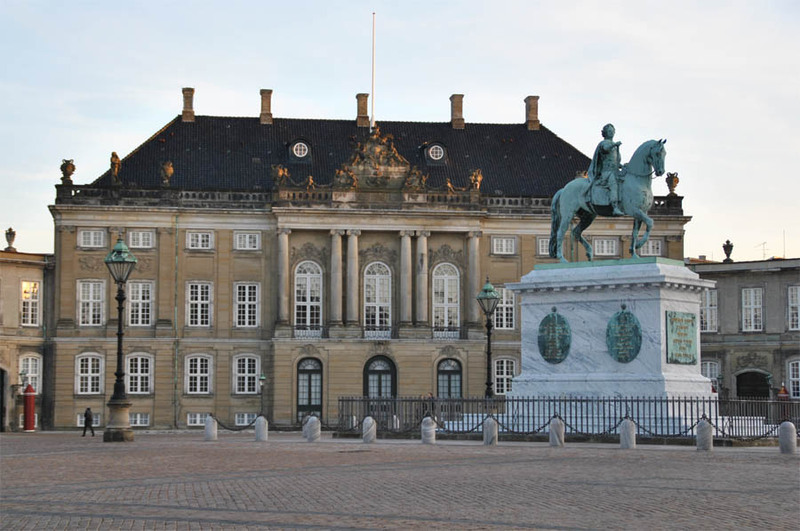 Most social functions were curtailed, and the king received only gentlemen at Christiansborg, his royal residence, for stag dinners, hunts, and card parties. Henry Bedinger, the Virginia gentleman equally handy with a gun, a pack of cards, or a well-told tale, soon came to be in great demand with the Danish monarch. Princess Louise of Hesse-Kassel, wife of Prince Christian of Glücksborg, living in the neighborhood of Saint Anna's Platz as did the Bedingers, would often pass Caroline Bedinger and her children in their daily walks. 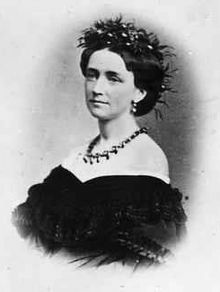 In June 1856, Henry Bedinger described for his sister Henrietta Bedinger Lee one of the social functions he attended by special invitation of the Danish king. 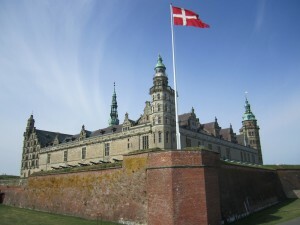 Bedinger arrived at Jaegerspris Castle, the king's summer residence outside Copenhagen, at eight o'clock one evening, the sole foreign minister among twenty guests invited to the court. 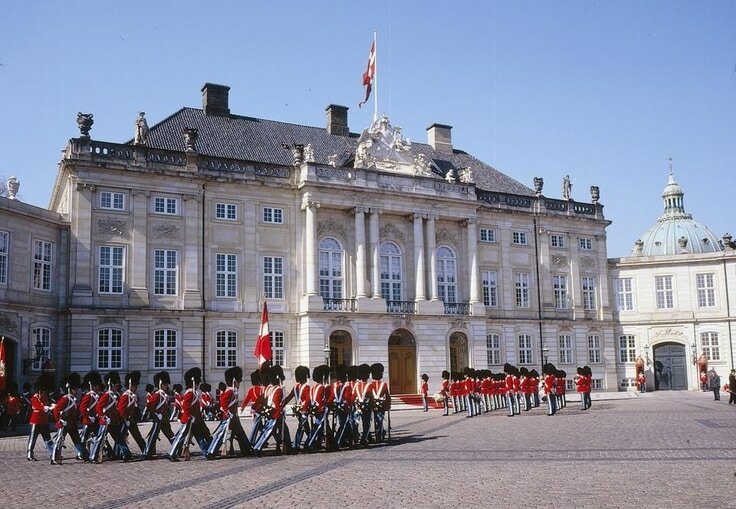 At nine the social functions he attended by special invitation of the Danish king. Bedinger the grand marshal announced that the king would receive his guests, and they repaired to the reception room where they were greeted by King Frederick and his wife, now the Countess Danner. The king shook hands cordially, the American diplomat recalled, and the countess was extremely affable. "Tea was immediately announced and the King led the way to the table, tucking the Countess under his arm," Bedinger wrote. "The seat assigned me was at her right side, and in a short time we became the best of friends.” Immediately after tea the king and his guests retired for the night. The next day Bedinger breakfasted in his rooms, then took a long walk through the exquisite grounds around the castle. At ten o'clock four carriages were ready to take the guests for a drive with the king. "First the King in a little two-seat phaeton drawn by four most beautiful little black ponies, the King driving himself, and by his side the Minister of Foreign Affairs," Bedinger recounted to Mrs. Lee, "then the two ladies and the Chief Minister of State, then the Chief Admiral of Marine, the King's first aide-de-camp and your brother, then the rest!” At one o'clock the party reached a beautiful pavilion where the royal band played during a tremendous luncheon. Bedinger wrote that he had been seated beside the Countess Danner, who commented that he wasn’t eating. "I never eat anything, Madam," Bedinger replied, "except rose leaves and dew.” The Countess Danner clapped her hands, laughed aloud, and repeated it to the king, who drank the American's health and ordered the band to play "Yankee Doodle”. Bedinger was seated beside the Countess Danner, who commented that he wasn’t eating. "I never eat anything, Madam," Bedinger replied, "except rose leaves and dew.” The Countess Danner clapped her hands, laughed aloud, and repeated it to the king, who drank the American's health and ordered the band to play "Yankee Doodle”. Bedinger was amazed when, at four o'clock, the entourage dined again, at the palace, and everyone ate heartily. "After dinner another long and delightful drive, another pavilion with tea, music, champagne and more monstrous eating," Bedinger told his sister. When they returned at half past ten it was still broad daylight. Altogether, he concluded, it was a "fresh, new and very pleasant" experience. Henry Bedinger did experience one major problem during his sojourn in Copenhagen. Instead of achieving financial security, he was impoverished by the style of living expected of a diplomat in Europe. He was pleased when Congress raised his rank to the ministerial level and recommended his salary be increased to $7,500 a year. "Well, of course, we clapped our hands for joy when we saw it," he wrote Edmund Lee, "For absolutely we had been doing little better than starving along, not being able with the strictest economy to save money enough to bring us home again.” In anticipation of additional funds, the Bedingers “set up a handsome carriage and horses ... and made other efforts to represent in a dignified and decent manner our noble country at this mighty and magnificent Court”. His salary increase was never approved, however, and Henry Bedinger experienced financial difficulties throughout his stay in Europe. For a mountain high and bold. Bedinger wrote to the new president, James Buchanan, early in 1857 requesting to be relieved of his post, but by late June he had not received an answer. His father-in-law General Rust, intervened with the White House on his behalf, and Bedinger's resignation was accepted in August. His hopes for a speedy reunion with his family were dashed, however, when the president asked him to remain in Copenhagen until his successor arrived. "I am living, oh, I might say dying to see you," he wrote to his wife in December. "Think of him who is far away in lonely exile. “Parties commence, duller than ever - this is just a horrible mud hole!" A few weeks later, he again expressed his boredom and impatience: "Yesterday was the King's hunt and dinner, and in the evening grand concert and huge jam at Prince Ferdinand's. The same old treadmill!" Finally, in the summer of 1858, Bedinger's replacement, Judge James M. Buchanan, of Maryland, arrived and Bedinger was free to sail home. After a joyous reunion with his family in New York, he returned to Shepherdstown, where he learned that he was to be appointed superintendent of the U.S. armory at Harpers Ferry. As a local celebrity, the ex-minister to Denmark was given a warm welcome on his return. The Baltimore Sun for October 22 carried notice of a testimonial dinner to be "tendered to the Hon. H. Bedinger by the citizens of Jefferson Co., Va., irrespective of party”. The weather suddenly turned cold on the evening of the outdoor barbecue dinner. Standing bareheaded in chilling wind, Henry Bedinger thrilled his spell-bound audience, but the elements proved too much for him. The next day, he became ill with fever. Pneumonia set in, and in less than three weeks he was dead. James R. McDonald, U.S. consul at Hamburg, sent Mrs. Bedinger condolences from all the consulates of northern Europe. America's consul in Liverpool, England, Beverley Tucker, also paid tribute to the "lofty character, noble nature, and rare genius" of his old friend and fellow diplomat. Henry Bedinger was buried in the family cemetery at Bedford, near his beloved Blue Ridge Mountains and Potomac River.